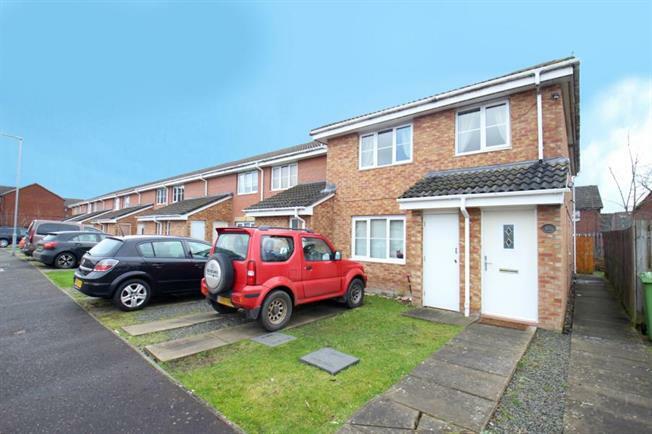 2 Bedroom Flat For Sale in Glasgow for Offers Over £90,000. Beautifully presented two bedroom main door upper cottage flat in a desirable modern development, well placed for access to the city centre and local amenities. The property offers good accommodation and is in move in condition. The accommodation mainly comprises reception hall, lounge, fitted kitchen, bathroom and two bedrooms. A main door entrance leads to a bright reception hall with stairs to the upper floor. The reception hall provides access to all of the apartments. The lounge is positioned to the front of the building and is generous in size, with a recess area providing ample space for a dining table and chairs. The kitchen is well fitted with good quality units and worktops. The bathroom features a co-ordinating white suite, tiling and wall mounted shower. Both bedrooms feature a storage cupboard. The property features storage heaters throughout, double glazing, and a private garden area to the side which is enclosed with fencing. This is a great flat which is in move in condition, and would suit young and older purchasers alike.